Can Someone Have an Allergic Reaction to Meth? Addiction TreatmentCan Someone Have an Allergic Reaction to Meth? An allergic reaction to meth? Is that a real thing? Most types of medicine come with unintended effects. These symptoms tend to be particularly pronounced with powerful medications and with recreational drugs. Methamphetamine, a Schedule II central nervous system stimulant, was originally intended for use in the treatment of ADHD. A variant is also used in over-the-counter nasal decongestant products. Use of meth is known to come with serious side-effects even with small prescription doses; with the kind of liberal doses that recreational users resort to, however, these effects can be particularly pronounced. An allergic reaction to meth can be one of these effects. It’s important to know what such a reaction looks like; if a loved one uses meth and experiences an allergy, it could turn fatal. It’s important both to know how to tell if someone is shooting up drugs and to know how to recognize an adverse reaction. You could save them with prompt action. The first step to helping someone is knowing when they are if someone is shooting up drugs. As with many other drugs, meth users tend to adopt surreptitious ways. It’s important to learn to look out for signs of use. Looking out for physical signs: It’s important to be on the lookout for signs of drug paraphernalia — glass tubes, syringes, lighters, white powder, burned-up plastic bottles, battery acid and so on. Looking out for physical and behavioral signs: Physical signs of shooting up meth include unnatural levels of energy, little need for sleep, and repetitive behaviors. Looking out for dangerous symptoms: As with many other drugs, methamphetamine is capable of life-threatening effects. An overdose is just such an effect. Symptoms can include agitation, cardiac pain, breathing difficulties, seizures, stroke and stomachaches. If you see any of these symptoms it’s important to go out and seek immediate medical help. An unexpected allergy is a possibility, as well. It can show up even in users who have had a habit for long. An allergy can be fatal. Symptoms can include swelling of the face or mouth, a terrible skin rash, or itchy hives. How do you deal with dangerous methamphetamine reactions? While detox and rehab are the right choices to make for long-term release from a methamphetamine habit, an allergic reaction to meth and other dangerous symptoms need to be handled by medical personnel trained in emergency medicine. A trip to the emergency room is essential. Certainly, in some states, arrest is a possibility after treatment for overdose or an allergic reaction. Nevertheless, minutes count in such situations. It’s important to go to the ER. When the effects of a methamphetamine allergy show up, doctors at the ER can offer symptomatic medications to reverse these effects. The aim is primarily to keep symptoms from getting out of hand and causing injury. Patients are usually discharged within hours. Once these symptoms of allergy die down, however, you may receive advice about pursuing rehab. It would be good opportunity to ask questions and get some answers. 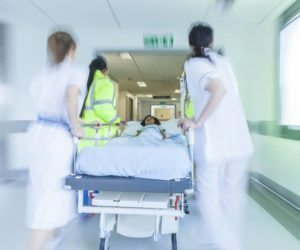 To many people who suffer from reactions severe enough to require a visit to the ER the experience gives them the clarity they need to seek treatment. Treatment is a good idea. Before you actually make a serious move, however, do your research to find the best possible care. White Sands Treatment offers some of the most advanced evidence-based care anywhere in the state. If you’d like to speak to a qualified specialist, you only need to call 877.855.3470.